The Back to Basics apple corer has a lot more uses than just removing the core from your apple. You can peel potatoes, peel apples and even make curly French fries. After all the fun you have in the kitchen, you may be dreading cleaning the apple corer. It's a good thing it is a lot easier than you may be anticipating. Remove all large remaining apple pieces from the corer by hand. 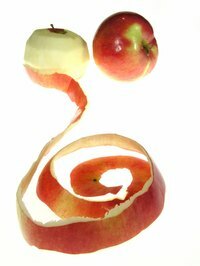 Throw the remaining apple pieces in the garbage or use your garbage disposal. Run the corer under warm water. This step will help remove most of the apple juice and any small apple pieces left behind from your apple coring. Place a dime-sized amount of mild dish soap on a clean dish rag. Run the dish rag under warm water in your kitchen sink before hand washing Back to Basics apple corer. Adjust the crank on the corer to clean the areas on the stainless steel shaft that are difficult to reach. Make sure to clean the adjustable blade, base and all other areas of the corer. Run warm water over the corer to remove any remaining dish soap. Towel dry the corer to remove water and prevent water spots. What Kind of Apples Are Good for Apple Pies?